አሏህ በዕብራይስ አሁንም “ላሜድን” ל ተሽዲድ ስናደርገው “አሏህ” אללה‎‎ ሲሆን ከውስጡ ሁለት “ላሜድ” ל ሲኖረው አንዱን ስንቀንስ እና በፈትሃ ስንጨርሰው “ኤሎሃ” אלוהּ ይሆናል፤ ትርጉሙም “አምላክ” ማለት ነው፤ የኤሎሃ ብዜት ደግሞ “ኤሎሂም” אלהים ነው፤ “ኤል” אֵל የኤሎሃ ምፃረ-ቃል ሲሆን የኤል ብዜት ደግሞ “ኤሊም” אֵלִ֑ים ነው፤ “ያ-አሏህ” יַאלְלָה “አሏህ ሆ” እና “ወ-ሏህ” וַאלְלָה “በአሏህ” ይባላል። አሏህ በአረማይክ አሁንም “አሏህ” ܐܲܠܵܗܵܐ ሲሆን ከውስጡ “ኤላህ”ܐܠܗܐ ማለትም “አምላክ” የሚል ቃል አለ፤ ዋቢ መጽሐፍት፦ 1. Bergsträsser, Gotthelf. 1995. Introduction to the Semitic Languages: Text Specimens and Grammatical Sketches. 2. Fitzmyer, J. (1997), The Semitic Background of the New Testament, Eerdmans Publishing. 3. Bennett, Patrick R. 1998. Comparative Semitic Linguistics: 4. Moscati, Sabatino. 1969. An introduction to the comparative grammar of the Semitic languages: phonology and morphology. ነጥብ ሶስት “አሏህና ታሪካዊ ፍሰት” አሏህ የሚለው ስም ነብያችን ነብይ ሆነ ከመላካቸው በፊትና ቁርአን ከመውረዱ በፊት በሴመቲክ ዳራ ደግሞ ከሁሉ በላይ የሆነው አንዱ አምላክ ሲጠራበት የነበረ ስም እንደነበር የተለያየ መድብለ-እውቀቶች*Encycolopedias* ሆኑ ታሪካዊ ፍሰቶች ያትታሉ፦ 1. የሃይማኖት መድብለ-እውቀት 1987: “አላህ የሚለው ስም ስረ-መሰረት የጋራ በሆኑ በተለያዩ ጥንታዊ የሴም ቋንቋዎች ይገኛል” ገጽ 27. Encycolopedia of religion 1987: “the orgin of Allah is found in a root common to various ancient semetic languages” p27. 2. የክርስትና መድብለ-እውቀት 2001: “ ቅድመ-ቁርአን አረብ ተናጋሪ ክርስቲያንና አይሁድ እንዲሁ አላህ ለታላቁ አምላክ ይጠቀሙበት ነበር” ገጽ 101. Encyclopedia of Christianity 2001: “before Quran Arabic-speaking Christians and Jews also refer to supreme God as Allāh” page 101. 3. የኢስላም መድብለ-እውቀት 1913: “አረቦች ቅድመ-ነቢዩ ሙሃመድ በነበሩት ዘመናት አላህ የሚባል ታላቅ አምላክ ያመልኩ ነበር” ገጽ 302. Encyclopedia of Islam 1913: “Before prophet Muhammad Arabian was worshiping supreme God who is Allah” page 302. 4. የብሪታኒካ መድብለ-እውቀት 1996: “ቅድመ-ቁርአን በነበሩት አረቢያን መጽሐፍት ውስጥ አላህ የሚለው ቃል ይገኛል” ገጽ 106. Encyclopedia of britannica 1996: “Before Quran The word Allah was in the Arabic books” page 106. 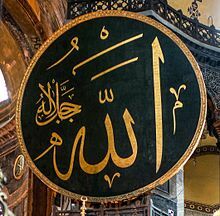 Medallion showing "Allah" in Hagia Sophia, Istanbul, Turkey. እነዚህ 99 የባህርይ መልካም ስሞች በቁርአን የተገለጹት ናቸው እንጂ የአላህ መልካም ስሞች 99 ብቻ ናቸው ማለት አይደለም፣ ” አላህ 99 ስሞች አሉት ” ነው እንጂ ” የአላህ ስሞች 99 ናቸው ” የሚል የለም፣ ምክንያቱም ነቢያችን ራስህን በሰየምክበት፡ በመጽሐፍህም ውስጥ በጠቀስከው፡ ከፍጡሮችህም ለማንኛውም ባሳወቅከው፡ አንተ ዘንድም ብቻህን ባወቅከው ስሞችህ እለምንሀለሁ ብለዋል፦ Musnad Ahmad Book 5 number 267 It was narrated by Abdullah Ibn Mas’ud that the Prophet pbuh said: Whoever is ever afflicted by such as depression and sadness and then recites: O Allah, verily I am your servant and the son of your servant, the son of your amah (female servant), my life is in your hands, it passes in Your law, implimented as You willed, I ask of You with all the Names which is Yours, which You have named Yourself or taught anyone of your creations,or brought down in Your books, or which You have hidden by Your side in the unseen world. 2.ማወቅ Sahih Bukhari, Volume 3, Book 50, Number 894: Narrated Abu Huraira: Allah’s Apostle said, “Allah has ninety-nine names, i.e. one-hundred minus one, and whoever knows them will go to Paradise.